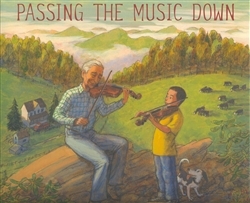 A young boy travels to the hills of Appalachia to meet the old-time fiddle player whose music he admires. “Will you teach me all your tunes?” the boys asks, and thus begins a friendship that will forge a bond between generations as the boy assumes the mantle of tradition, learning the music that came before him and promising to pass it on. Inspired by the lives of two renowned fiddlers, this lyrical story is told to the best of the changing seasons. Just as seedlings grow with spring rain and summer sun, the boy develops into a fine musician under the man’s care and instruction. From playing on the front porch to performing this uniquely American music at folk festivals, the two carry on the tradition of passing down the music. “The folk process,” as Pete Seeger has called it, easily lends itself to a populist pastoral myth, with supposedly pure rural tunes handed anonymously from generation to generation. “Passing the Music Down,” written by Sarah Sullivan and illustrated by Barry Root, and “When Bob Met Woody,” written by Gary Golio and illustrated by Marc Burckhardt, break through the anonymity and illuminate the process, even as they remain at least partly beholden to fabled styling. At first, “Passing the Music Down” seems to be a sweet, corny tale about going native. Come summer, Sullivan writes with a down-home twang, “folks get to talking about tuning up” and heading to the mountains east of Tennessee to listen to the fiddle players and banjo pickers. “Play ‘Liza Jane’!” shouts a boy, an aspiring fiddler, to a gnarled country virtuoso. The boy’s family then befriends and visits the old fiddler, buying a place in the mountains near his farm. There, the old man and the boy live out a rural idyll as the folk inheritance is bestowed. Only in an author’s note at the end do we learn that the story is based on two musicians well known in old-timey music circles: the late Melvin Wine, a grizzled veteran who cut quite a figure during the folk revival of the 1960s, and his eager student, Jake Krack, who has gone on to become an ace fiddler in his own right. The details about the two fiddlers flesh out the storybook version. It turns out, for example, that young Krack’s teacher in Indiana encouraged the initial meeting between the two. Suddenly, a story that verged on sentimental fluff — though enlivened by Root’s evocative clover and mountain mist — is part of musical history, and it is all the better for it. It is hard to imagine Bob Dylan’s life and music as fodder for a children’s book, let alone a sentimental one. By sticking to Dylan’s early years, though, “When Bob Met Woody” tells a true-life story not entirely unlike that of Wine and Krack. Already familiar to baby boomers, the story will come as news to their children and grandchildren. The ambitious young musician Bob Dylan (born Robert Zimmerman) strikes out from middle-class Minnesota in search of his hero, the hobo songster Woody Guthrie. After finding Guthrie bedridden in a New Jersey asylum, Dylan sings for the stricken man, who warmly approves. Though the setting is Greystone Hospital in Morris Plains, and not the mountains of West Virginia, the folk process has recurred. Golio says he aimed to write “a story that told the truth,” and insofar as the truth can be told about Dylan, he has succeeded, making only a couple of trivial factual slips. He charmingly delivers the boy behind the ragamuffin troubadour, doing justice to young Zimmerman’s jumbled early musical interests, including rock ’n’ roll, however off kilter it seems in the familiar folk romance. “When Bob Met Woody” should stick in young readers’ minds, especially if accompanied by the musicians’ recordings. Somewhere in Dylan’s singular evolving art, Guthrie has always been present. And it’s important for children, as it is for the rest of us, to understand that a very particular genius — on the order of Guthrie and Dylan, and Wine and Krack — has a crucial place in the real-life folk process. ­Sean Wilentz teaches history at ­Prince­ton. His latest book, “Bob Dylan in America,” will appear in paperback this fall. A version of this review appeared in print on May 15, 2011, on page BR22 of the Sunday Book Review with the headline: Oldies for Newbies. Inspired by such prominent country fiddlers as Melvin Wine, Lester McCumbers and the much younger Jake Krack, Sarah Sullivan pays homage to musical traditions that don't thrive in coastal conservatories. A young boy, sent by his teacher in Indiana, travels with his parents to Appalachia to find the old-time fiddler whose music he most admires. The family eventually moves to West Virginia, and a musical mentorship develops into a friendship. That plot might not be common, but two aspects of it appeal broadly: that music-making builds bridges across generations, and that different regions have their own powerful appeal. Sean Wilentz teaches history at ­Prince­ton. His latest book, “Bob Dylan in America,” will appear in paperback this fall.